Fuses are used for low and high voltage circuits of moderate to high capacity, where frequent operations are not expected i.e. for the protection of distribution transformers, small and medium size motors, lighting circuits,branch circuits of distribution lines, and industrial plants and commercial buildings up to 600 A at 250 V, 500 A at 600 V and in high voltages up to 100 A at 161000 V. The protection by fuses is advantageous from the point of view of cost but it does not permit supervision and are to be replaced in the field. Moreover, when the fuse blows, it takes quite some time to renew it and restore the supply. Circuit breakers are much more convenient and quick and are very useful where slight overloads occur often or where heavy currents have to be broken. Circuit breakers are mechanical devices designed to close or open contact members, thus closing or opening an electrical circuit under normal or abnormal conditions. Automatic circuit breakers, which are usually employed for the protection of electrical circuits, are equipped with a trip coil connected to a relay or other means, designed to open the breaker automatically under abnormal conditions, such as overcurrent. The automatic circuit breakers perform the duties. 4. It makes and breaks the short circuit currents of magnitude up to which it is designed for. The circuit breaker performs first three duties satisfactorily but in performing fourth duty i.e. When it is to make or break short circuit currents, it is subjected to mechanical and thermal stresses. The circuit breakers are rated in terms of maximum voltage, number of poles, frequency, maximum momentary and 4 second current carrying capacity. The interrupting or rupturing capacity of a circuit breaker is the maximum value of current which can be interrupted by it without any damage. The circuit breakers are also rated in MVA which is the product of interrupting current, rated voltage and 10-6 . 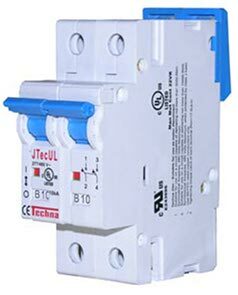 A circuit breaker consists of fixed and moving contacts which are touching each other under normal conditions i.e. when circuit breaker is closed. Whenever a fault occurs, the trip coils get energized, the moving contacts are pulled by some mechanism and, therefore, the circuit breaker is opened and the circuit is broken. The basic construction of a circuit breaker requires the separation of contacts in an insulating fluid which serves two functions. 1. Extinguishing the arc drawn between the contacts on the opening of circuit breaker. 2. Providing insulation between the contacts and from each contact to earth. Arc voltage: It is the voltage that appears across the contacts of the circuit breaker during the arcing period. Arc path is purely resistive, the arc voltage and current are in phase. 1. High resistance interruption: This method is made in the following methods. By increasing the length of the arc. By splitting the arc into number of small arcs. By restrain or confining the arc to a narrow channel. 2. Low resistance interruption: This method is employed for arc extinction in a.c circuits only. In this method, arc resistance is kept low until current zero where the arc extinguishes naturally and is prevented from restriking inspite of the rising voltage across the contacts. All modern high power a.c. circuit breakers employ this method for arc extinction. For Detailed explanation on high resistance, low resistance, rate recovery theory and energy balance theory click here. A rapid increases of dielectric strength or post zero resistance is necessary for successful interruption and this can be achieved by lengthening of the gap, cooling and blast effect. Recovery voltage, active recovery voltage, restriking voltage, rate of restriking voltage, current chopping is explained in the link below. RRRV, Restriking voltage, current chopping click here. Resistance switch: To control the R.R.R.V. The resistance is connected parallel to the breaker contact or parallel to arc. Some part of current flow through the resistance. There are many types of circuit breakers. Some of them are given below. Oil circuit breakers which employ some insulating oil for arc extinction. Air-blast circuit breakers in which high pressure air-blast is used for extinguishing the arc. Sulphur hexa fluoride circuit breakers in which sulphur hexa fluoride (SF6) gas is used for arc extinction. Vaccum circuit breakers in which vaccum is used for arc extinction. Circuit breaker ratings: Breaking capacity, Making capacity, short time rating and normal current rating. full article. click here. This is Feiniu Cable Factory. We mainly produce overhead power cable or aerial bundled power cable. Could you provide us your address detail ? We will check the cheaper delivery cost for you ? Thank you for your reply! We will provide you more contact detail of us. Factory: Shijiazhuang City Feiniu Cable Co., Ltd.